This is for everyone, fit or sedentary, plump or trim, limber or restricted in your movement. Yoga is a practice, not a requirement of perfection. When you nourish yourself with this hour of mind peace and body movement, you will feel right in the world. Yoga has many forms of practice and many levels of skill, and rest assured – the type of yoga our instructor will be leading will be perfect for you. We’ll be doing gentle flow yoga with options offered for different skill levels. The goal is physical health and mental well-being, facilitated by bodily postures (asanas), breathing techniques (pranayama), and meditation (dyana). You can do it, no matter who you are or what you’ve tried in the past. The beauty of yoga is that your best is just right for you. You needn’t be able to put your ankle behind your head or hold a plank position for 3 minutes or even touch your toes. If you’re feeling the stretch and working your muscles and concentrating on your balance – and most of all if you’re consciously existing in the here and now and you’re breathing fully and deeply, you’re practicing yoga just the way it’s meant to be practiced, and that’s a beautiful thing. We are so pleased to welcome Ogden Kruger, a yoga practitioner since 1983 and a teacher for the past 10 years, to lead us in Kundalini Yoga this year, which will involve a practice of Morning Sadhana, very simple exercises to energize the spine, wake the body up and invigorate the glandular systems of the body. With Ogden, we will begin with the traditional tuning in of the Adi Mantra and conclude with a chanting meditation for the Shakti Power of Women. Ogden will give brief explanations of the mantra, tuning in, breathing and asana. 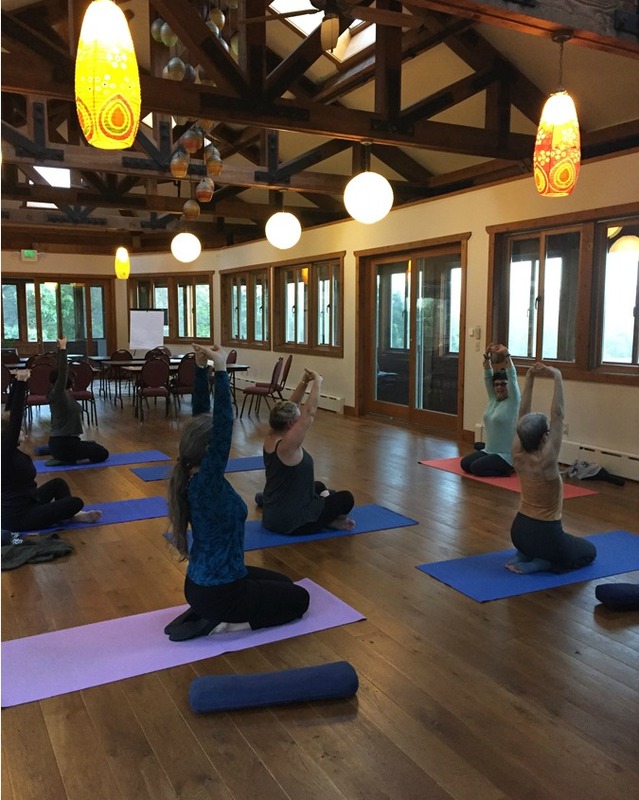 Yoga classes will be held on Friday and Saturday afternoons at 3:30, as we wind down from our day of workshops and center ourselves once again before our Evening Salon and Mastermind Session. It’s a beautiful time of day; as the sun is moving toward the horizon and evening time. We move from our tables and chairs at the last workshop to the open area surrounding the grand piano, and settle on our mats for quiet meditation. All around us are massive vistas of the Catskills, soon to fade into evening. As you practice yoga, honoring your body and being present in the world, you will feel that you’re in the very best place you could be. And hey, if yoga is just not your thing, no problem. Everything at Women At Woodstock is about you and what’s best for you. If you’d rather return to your room for a bit of solitude, or take a walk on the grounds, or read a book or catch up on emails, we’ll respect that – and we’ll see you at the Evening Salon at 5:00! This entry was posted in 2019 Workshops, Activities, Ann's Blog and tagged Indira Abby Heijnen, yoga, yoga at Women At Woodstock, yoga classes. Bookmark the permalink.